Along with the torrent of hot gas and oil spewing from the bottom of the sea, hot hints and rumors were also streaming out of the Gulf of Mexico in the spring of 2010. Several scientists on the scene of the Deepwater Horizon oil spill were warning that not all of the petroleum gushing out of the broken drill pipe near the seafloor was making it to the ocean surface. Some might be flowing laterally in deep-sea plumes, they said. “Most people think oil floats,” said Chris Reddy, an environmental chemist at Woods Hole Oceanographic Institution (WHOI). But this oil spill, occurring at an unprecedented depth, was different from most spills, which happen at or near the surface. “Oil is comprised of thousands of individual petroleum hydrocarbon compounds, and no one really knew how each would behave under the high-pressure, cold-temperature conditions a mile deep,” he said. The largest previous blowout below the surface happened at Petróleos Mexicanos’s Ixtoc 1 well 165 feet deep in the western Gulf of Mexico in 1979. After the Deepwater Horizon blowout, WHOI scientists hastened to re-read a seminal report on that spill compiled by WHOI marine biogeochemist John Farrington, which documented a subsea plume of methane and benzene spreading away from the Ixtoc well. Neither the oil industry nor government agencies had expertise in deep-sea plume hunting. WHOI scientists, however, knew a thing or two about it. In their decades-long explorations of natural phenomena in the deep ocean, they had often targeted the plumes of buoyant hot fluids from hydrothermal vents, which spew like geysers on the seafloor and trail away into the depths like smoke out of smokestacks. 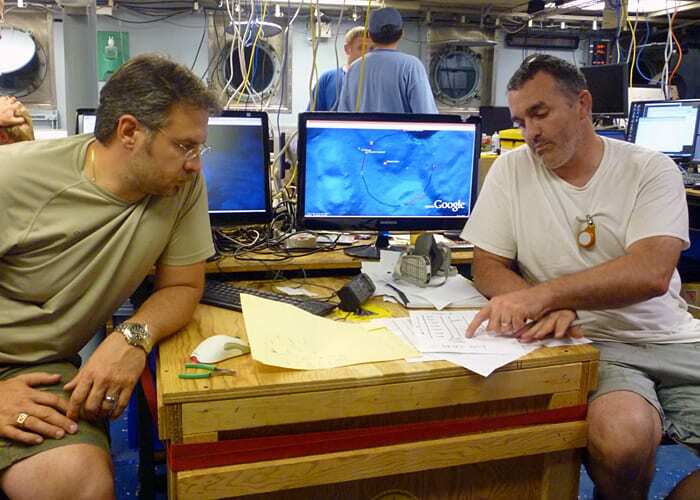 In June 2010, WHOI scientists mustered to search for the suspected deep-sea plumes in the Gulf of Mexico. Combining their individual fortes with unique deep-sea technology and decades of experience, they embarked on a rapid-response expedition that revealed where oil and gas venting from the broken riser pipe went and what happened to it along the way. Their findings were published in two prestigious scientific journals: Science on Aug. 19, 2010, and Proceedings of the National Academy of Sciences on July 18, 2011. The research team began by going to the source. The scientists “actually got a sample of the oil coming straight out of the broken well, with a piece of equipment that was not designed for an oil spill,” Yoerger said. This isobaric gas-tight sampler, developed by WHOI geochemist Jeff Seewald and colleagues, was designed to sample fluids from hydrothermal vents, but it gave the scientists the quintessential sample of exactly what was in the oil and gas that entered the ocean from Deepwater Horizon. (See “A Slow Sip from a Big Gusher”). Based on this “starting oil,” Seewald said, the scientists could trace how much of which chemical compounds went where—what stayed within the ocean; what rose to the surface and evaporated into the atmosphere; what didn’t evaporate and was either consumed by microbes or washed ashore; what sank back to the seafloor and may be affecting corals that live in the Gulf. (See “Life and Death in the Deep Sea”). Within the ocean, the scientists did not expect to see a plume that looked like a dark syrupy subsea river of oil. Rather, the plume was a body of clear, odorless water with high concentrations of hydrocarbons moving within it. It’s not a cakewalk to find such a plume a mile beneath the surface. Conventional methods—lowering sensors on lines dipped into the sea from ships—had limited effectiveness. “You’re literally poking holes in the ocean,” said Yoerger—hitting and missing, and trying to assemble individual hits into a three-dimensional picture of the plume. Imagine trying to map a smoke trail in a vast sky somewhere below the clouds by dangling lines with smoke detectors from a helicopter far above the clouds. But Yoerger and other WHOI scientists had developed unique technology to search for deep-sea plumes. One of these was Sentry, an untethered vehicle designed to swim on its own in the depths, avoiding obstacles and always keeping track of its location in a region where GPS doesn’t work. “Sentry can cover lots of ground, fast,” said WHOI scientist James Kinsey. Equipped with sonar, cameras, or other sensors, it can reconnoiter the deep. One of those sensors is a portable underwater mass spectrometer developed by Camilli, which can measure minute quantities of chemicals in the ocean. Mass spectrometers are complex, delicate instruments sometimes as big as a room, but Camilli’s device, called TETHYS, is “about the size of a watermelon and requires the power of about the equivalent of a laptop computer,” he said. It was built tough to operate in the less-than-ideal conditions of the deep. 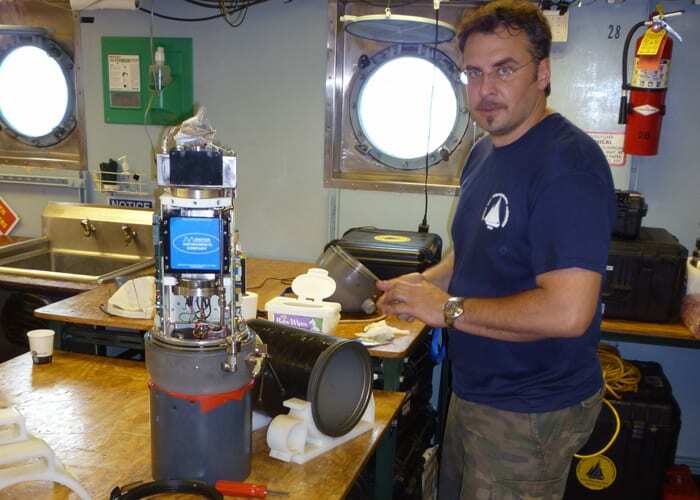 Camilli had designed TETHYS to work with autonomous underwater vehicles such as Sentry. The combination of Sentry’s mobility and TETHYS’s sensitive nose made it a powerful oceanographic bloodhound. 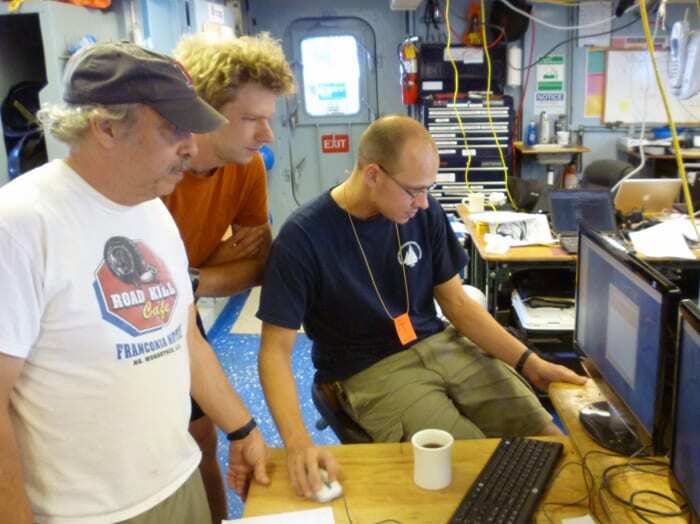 By sheer coincidence, just seven months before, the team of Reddy, Yoerger, and Camilli had used Sentry and TETHYS off the coast of Santa Barbara, Calif., to investigate so-called “cold seeps,” areas where oil and gas naturally leak into the ocean from cracks in the seafloor. (See “A Robot Starts to Make Decisions on Its Own”). “Then the oil spill happened,” Yoerger said. 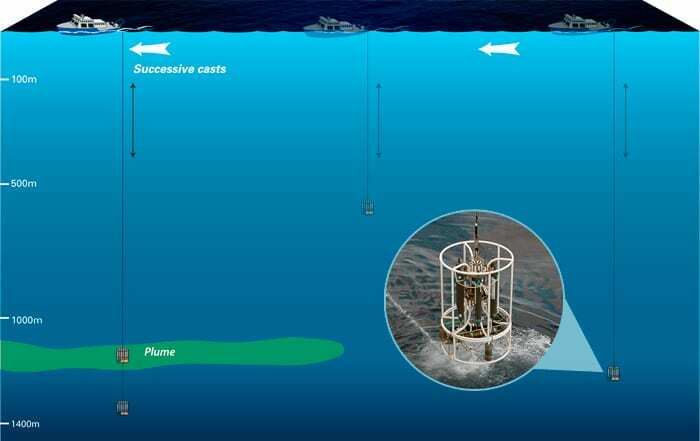 In early June 2010, scattered in various places, the scientists hustled to write a funding proposal to the National Science Foundation (NSF) to use their technology and experience to search for the suspected hydrocarbon plumes deep in the Gulf of Mexico. Yoerger was in Woods Hole. Reddy wrote his proposal on a plane, shuttling between Woods Hole and Louisiana. Camilli was on a ship directly above Deepwater Horizon’s failed blowout preventer, using acoustic instruments to measure how much oil and gas was flowing out of the broken riser pipe. Aboard the research vessel Endeavor, the research team first found evidence for a plume two months after the blowout in April. It flowed southwest of Deepwater Horizon about 3,600 feet deep. They searched for additional plumes in other directions and at other depths using a technique oceanographers had perfected to search for plumes from hydrothermal vents. It’s called a “tow-yo,” and it involves dangling a package of sensors including TETHYS into the ocean from a line connected to a ship. The ship tows the line horizontally while a winch alternately hoists the package up and lowers it down again like a yo-yo. It’s a little like casting out a fishing line to plop into a river you can’t see, but the idea is to cover as much breadth and depth as possible in an effort to land the package in a plume. The crew of Endeavor circled in a 3.1-mile radius nearly completely around the broken well, skillfully tow-yo-ing instruments between 2,600 and 4,600 feet deep on a mile-long cable in the sea. “One of the most difficult and probably scariest things was that we were operating with just an unbelievable amount of ship traffic around us,” Camilli said. Perhaps 100 vessels crowded the area, some skimming and burning oil at the surface, others working on operations to stop the gushing oil and gas below. The sensors on the tow-yo confirmed the strongest petroleum hydrocarbon readings west-southwest of the well site at a depth of about 3,600 feet. That’s where scientists dispatched Sentry. Traffic, this time of the acoustic variety, presented the team with more challenges. Sound waves are the means to transmit data under water. Sentry navigates, and the scientists communicate with the robot, via sound signals. “There were so many other undersea vehicles and robots in the area using various acoustic frequencies that we had to be very concerned about cross-talk and interference between these various underwater assets,” Camilli said. Carried within Sentry, TETHYS automatically took measurements every few seconds of specific compounds such as methane, benzene, and naphthalene. Sentry tagged each data point with a location in the ocean, and transmitted it acoustically back to the ship in real time. The system collected “thousands of data points on each dive that conventional methods would have taken months to process,” Camilli said. Each data point was like a breadcrumb, accumulating to delineate a plume of hydrocarbons. 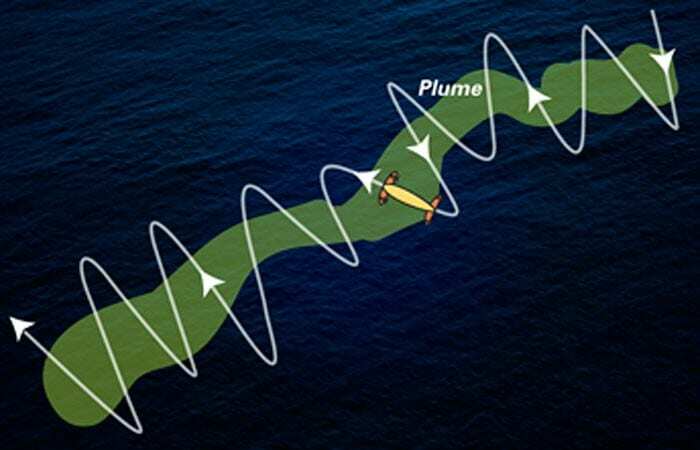 In 64 hours between June 23 and 27, in three dives covering 146 miles, Sentry revealed the shape of the plume. It was more than a mile wide and 600 feet high, and it flowed continuously southwest from Deepwater Horizon at a speed of about 4 miles per day. It was directed by prevailing currents and steered in some places by the contours of the seafloor. The scientists tracked it out to at least 22 miles, when the approach of Hurricane Alex forced them to break off operations. The scientists worked night and day to analyze their data. Their paper was written and submitted for peer review just 17 days after they disembarked from Endeavor. Their eagerly awaited research was published online Aug. 19, 2010, in the journal Science. They took part in a press conference in Washington, D.C., and their findings became widespread front-page news. The next step was to get samples from the plume to see what was in it. Samuel Arey, head of the Environmental Chemistry Modeling Laboratory at the Swiss Federal Institute of Technology, played a key role in developing a strategy for sampling. He was a co-author on the paper in Proceedings of the National Academy of Sciences. In collaboration with the National Oceanic and Atmospheric Administration’s ongoing damage assessment, the samples were sent within seven days to a laboratory and analyzed for the presence of more than 100 different compounds. The research team’s findings published in PNAS showed that the plume contained a preponderance of only six petroleum hydrocarbon compounds: benzene, toluene, ethylbenzene, and xylenes—a group commonly known as BTEX. “Why were these compounds in the plume and others weren’t?” Reddy asked. Thousands of compounds in Deepwater Horizon petroleum rose toward the surface like passengers on an elevator, he said; the BTEX compounds, however, seemed to get off at a lower floor 3,600 feet deep and proceed laterally as a plume. Why? The answer lies in the BTEX compounds’ chemical structure, which gives them their characteristic properties. They all have one benzene ring (six carbons in a hexagon, with three double bonds). That made them more likely to dissolve in water than straight-chained hydrocarbons. In oil spills at the sea surface, BTEXs can quickly evaporate into the air. But released deep down and far from the atmosphere, BTEXs have time to dissolve into the ocean water before having a chance to evaporate. The compounds, which are known to be toxic to living things, were not degraded by bacteria but rather remained in the deep. That raises new questions about the potential for harmful ecological impacts from the spill. The initial research by WHOI scientists has made it abundantly clear: Deep-water and shallow-water oil spills are not the same beasts. The interwoven chemical, physical, and biological processes that happen to oil in the deep ocean are different from what we had ever seen before. 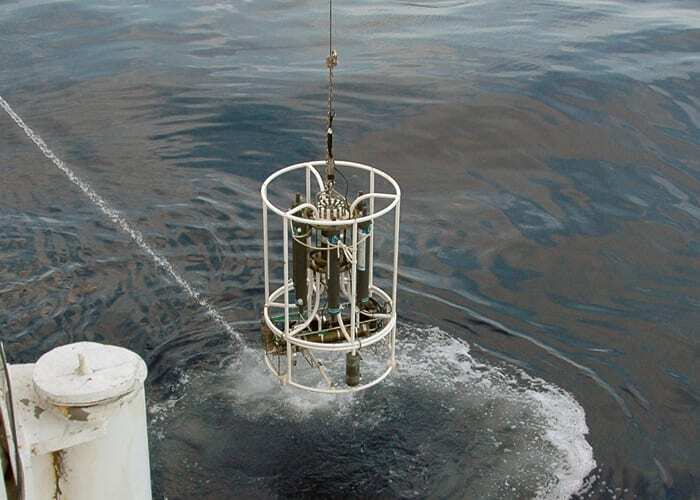 The research team searched for evidence of plumes around the Deepwater Horizon riser pipe using a technique called a “tow-yo,” which oceanographers had perfected to search for plumes from hydrothermal vents of the seafloor. 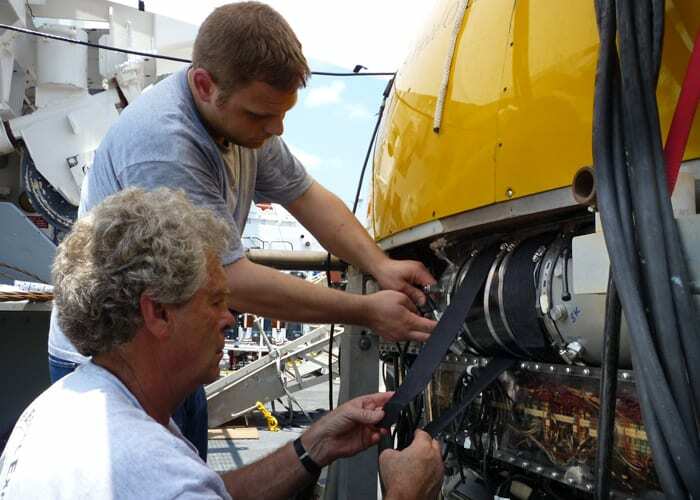 To tow-yo, researchers dangle a package of sensors into the ocean from a cable connected to a ship. The ship tows the cable horizontally while a winch alternately hoists the package up and lowers it down again like a yo-yo—in an effort to land the package within a plume. The crew of the research vessel Endeavor circled in a 3.1-mile radius nearly completely around the broken well, skillfully tow-yo-ing instruments between 2,600 and 4,600 feet deep on a mile-long cable in the sea. Sensors on the tow-yo confirmed strong petroleum hydrocarbon readings west-southwest of the well site at a depth of about 3,600 feet. 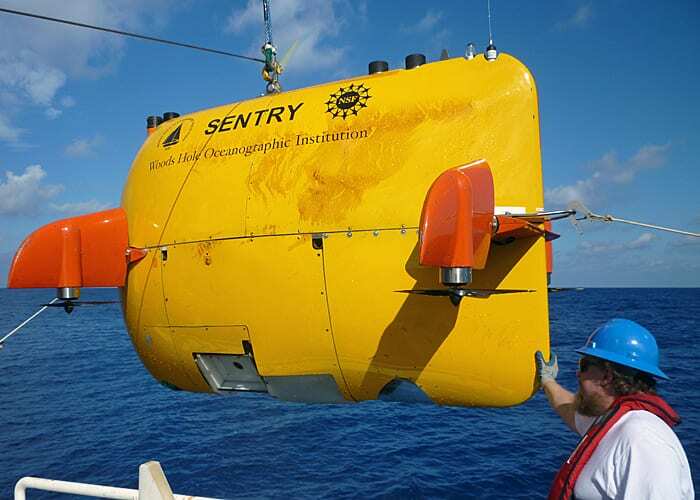 Scientists dispatched Sentry, an autonomous underwater vehicle (AUV), to that location, equipped with the TETHYS mass spectrometer to detect chemicals. Sentry zigzagged across the area, with TETHYS detecting where chemicals were and were not. In three dives covering 146 miles between June 23 and 27, Sentry sculpted the shape of the plume. It was more than a mile wide and 600 feet high, and it flowed continuously southwest from Deepwater Horizon at a speed of about 4 miles per day for at least 22 miles. The next step was to get samples of seawater directly from the plume to see what chemicals were in it. “We weren’t stabbing arbitrarily hoping to find something,” said WHOI chemist Chris Reddy. “We used a hunter-gatherer strategy: Sentry had hunted for the plume, told us exactly where to look, and we gathered right there within it.” The samples were dispatched to a laboratory and analyzed to look for more than 100 different compounds. The research team’s findings, published in Proceedings of the National Academy of Sciences in July 2011, showed that the plume contained a preponderance of only six petroleum hydrocarbon compounds: benzene, toluene, ethylbenzene, and xylenes.